I find no meaning in the happiness of angels. I know simply that this sky will last longer than I. There was no rancour, only a gentle parting of the ways. Sometime in my early teenage years I came to the conclusion that I no longer believed in God, realising that I couldn’t remember the last time I had. That my outlook on life - some vague notion of leaving the world a better place - didn’t change as a result, might suggest it was never serious; certainly, I don’t think I’d ever thought of the life that came next. Of course my outlook did change, or rather the scope, but not until much later and at an age when such goals feel foolishly optimistic, conceited even. At first I never gave it more than a passing thought; life would appear to have little purpose but there was plenty to keep me occupied. Age granted me time to think again, not through a fear of death, more a building curiosity on a question for which I suspected an unedifying answer. Thus I came to The Myth of Sisyphus & Other Essays. Albert Camus; born in 1913 in Algeria, died in 1960 in Paris, a contemporary of Jean-Paul Sartre and Simone de Beauvoir, a one-time communist - albeit during the 1930’s - who in criticising Soviet communism after the war managed to alienate his colleagues on the left, including Sartre who publicly denounced him. I confess, as with George Orwell, this only makes me like him more. 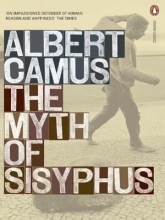 Camus was a proponent of absurdism; a philosophy describing the conflict borne from our desire for meaning in a meaningless world, and discussing how we should react when conscious of this fate. Six thousand dollars? It's not even leather!